Power your high-load Gold mount camera, rig, or accessories, up to a 175W draw, with the Anton Bauer HyTRON 140 Battery. Based on NiMH (Nickel Metal Hydride) chemistry, these high-capacity batteries don't carry the same flight, travel, or storage restrictions as Lithium-ion power sources. This means they are more flexible for professionals that require high-capacity power sources and travel often. Not only is the HyTRON 140 powerful, it is also intelligent. Sporting an onboard "Fuel Computer", the HyTRON 140 is constantly monitoring the batteries activity during use, recharging, and idle in order to provide accurate capacity metrics to the onboard LCD and Fuel Gauge in the viewfinder of compatible cameras with a Gold mount. Note: HyTRON batteries require an InterActive charger, as older chargers and chargers from other brands cannot communicate with the Fuel Computer. A microprocessor built into the HyTRON 140 is the brain behind RealTime LCD Display and Fuel Gauge viewfinder information. The Fuel Computer accurately monitors the energy in the battery by taking into account battery age, self-discharge, charge/discharge rate, operating conditions and previously experienced charge/discharge cycles. The battery constantly "learns" its precise state of charge and remaining capacity. This data is automatically transmitted to compatible InterActive chargers for optimal charging performance. Simultaneously displays both the remaining run-time (in 15-minute increments) and the percentage of remaining battery capacity (in 20% increments) at all times on the battery itself. Time is automatically updated based on the power draw. When no load is attached, the battery will display time remaining for a theoretical 20W load. Cameras which include the Anton/Bauer InterActive viewfinder feature connect with the battery's Fuel Computer to display an accurate "Fuel Gauge" of remaining battery capacity in the viewfinder. Reference your camera's owner's manual for proper menu settings. A thick, high-impact outer shell protects the battery cells from damage. 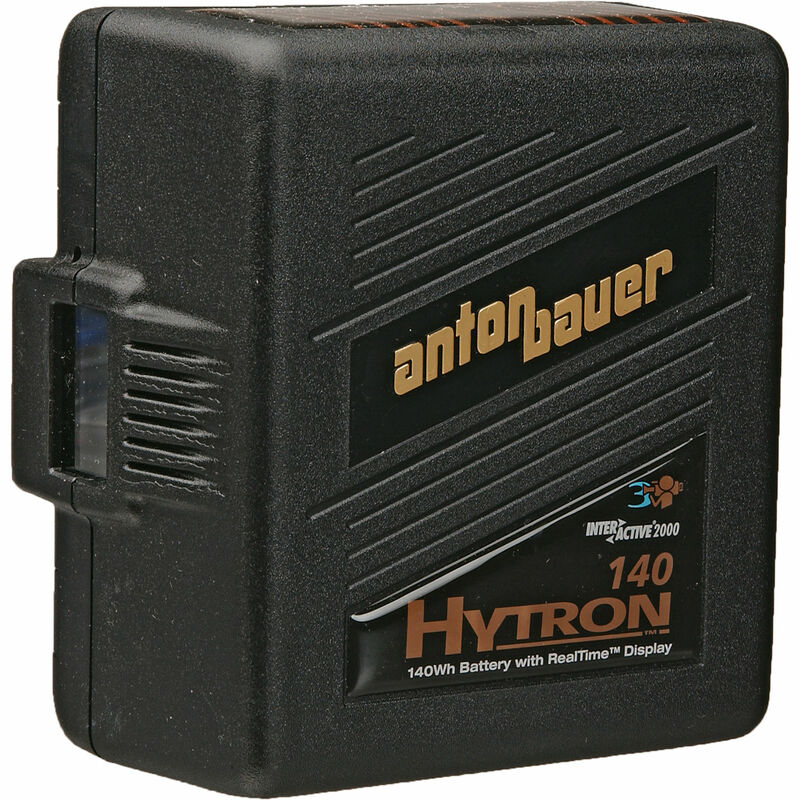 The HyTRON 140 incorporates a "Deep Sleep" feature which minimizes the self-discharge rate of the battery when it is inactive and stored for over 14 days when not on a charger. When picked up, subjected to a load, or placed on charge the battery's motion sensor and internal electronics will wake the battery so it will be ready for use. Box Dimensions (LxWxH) 7.1 x 5.7 x 4.1"
HyTRON 140 Battery is rated 4.7 out of 5 by 18. Rated 5 out of 5 by Anonymous from Unquestioned performance I have used a # of brands in my 22 years in business. None perform as consistently as AB. I know the life expectancy is 5 years. With strict adherance to maintenance protocol I've managed to get 10 years life. That is a solid ROI. Rated 5 out of 5 by John from Reliable Power Been buying these since the Hytron version came out and always get about 5 years of wedding work out of them. The smaller Hytrons failed after a year, but the big bricks last forever. Rated 4 out of 5 by Wynn W. from A Standard of the Industry I use this battery primarily to power my Panasonic HDX-900, a power hog that goes through batteries quickly. The Hytron is rugged and has a helpful display. It does not have travel restrictions when I fly. The only downside is its weight. Rated 5 out of 5 by Oklahoma High School Sports Express from Great battery that lasts forever ! I shoot hours of sporting events every day and these batteries easily last an entire game and thru the interviews. Usually I can even use them for at least half of the next game as well.